In my mind, I’m a Southern Belle. I wear sundresses, speak in genteel tones, and cook Baked Fried Chicken on Sunday nights. In my reality, I wear thick wool socks over my leggings and say “bag” in that particular nasal way that only a resident of Wisconsin can emulate. I will, however, stand by my oven “fried” chicken. Juicy on the inside, crisp on the outside, and packing a subtle kick, this is a healthy dinner recipe that Miss Mississippi herself could not resist. Fried chicken (and the entire concept of “meats and threes”) was mostly unknown to me until two of Ben’s and my best friends moved to Nashville, and I tried the real deal. I didn’t even think I liked fried chicken until I had it in Tennessee. Since, I’ve found good fried chicken a few places Up North, but it’s not something we go out for regularly, and I considered it way too fussy to make at home. Then, I met this Baked Fried Chicken and realized my unusual (but delectable) dreams of cooking fried chicken on Sundays were attainable after all. I came upon this recipe for Baked Fried Chicken in one of my newest cookbooks, Back Around the Table: An “In the Kitchen with David” Cookbook by David Venerable. 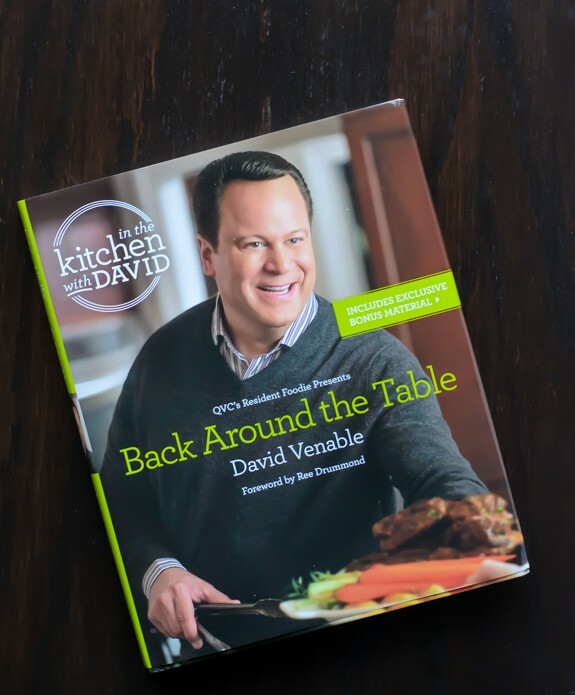 David is the program host of QVC’s cooking and dining show “In the Kitchen with David®,” and his latest book offers unique spins on comfort food. The book is divided into 11 “mini chapters” based on different themes, such as “Low and Slow” and “Fresh and Flavorful.” I found this to be somewhat confusing and would have preferred to see each meal category—appetizers, desserts, etc.—grouped together so that I could view the full breath of options at once, but some might enjoy the more thematic approach. My favorite chapter was “Light and Bright”, from which today’s Baked Fried Chicken recipe (or as the book calls it, “Skinny Fried Chicken”) hails. What makes fried chicken additive is the juiciness of the meat and the crispiness of the exterior. This Baked Fried Chicken offers both. A spicy buttermilk marinade gives the chicken unbelievable moisture and a nice kick, and a coating of crushed corn flakes makes the exterior irresistibly crunchy. I don’t generally care for corn flakes, but after one bite of Skinny Buttermilk Fried Chicken, I developed a new level of respect for this humble breakfast cereal. 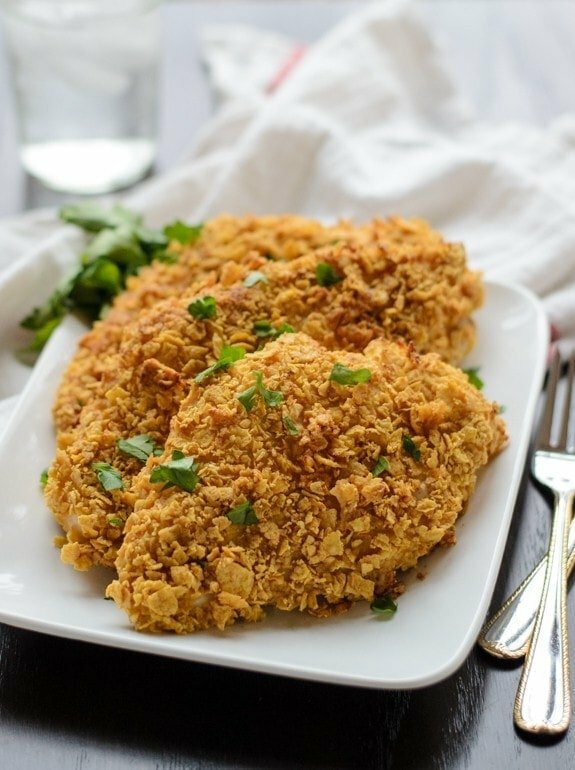 Although Skinny Buttermilk Fried Chicken requires advance planning (I found that letting the chicken marinate overnight really amped-up the “juicy” factor), and the coating makes a bit of a mess, it is absolutely worth it. Even when reheated the next day, the meat was still incredibly sweet and moist, a rarity among chicken breast recipes. Skinny Buttermilk Fried Chicken is set to become a Sunday fixture in our house. I’ll likely be wearing in thick wool socks instead of a sundress when I make it, but if I’m holding a mint julep, that evens out, yes? I think I’m ready for the cotillion ball. A healthy recipe for buttermilk chicken that tastes deep fried but is actually baked! A cornflake crust makes the chicken golden and crispy on the outside, and a buttermilk marinade keeps it juicy and sweet on the inside. This recipe is published as it is written in Back Around the Table, but I made a few changes: I halved the recipe to suit our smaller household, did not rinse the chicken breast, and used Sriracha for the hot sauce. I also found that a bit more flour and cornflake coating was necessary that the recipe calls for. I’d suggest making about 1.5 times the amount to save yourself a messy job of trying to crush more corn flakes when your mid-chicken dip. Erin? Did I miss something? How long do you bake it in the oven? Thanks! Duh. Never mind. I found it. This looks great! Thanks again. Hi Deb! Yes the chicken bakes for about 30 minutes, 15 at 400 degrees, then about 15 more at 350, though this may vary a bit depending upon the size of your chicken. Let me know if you need anything else! My friend is a wiz at buttermilk fried chicken. I’m always so jealous of her ways. I tried doing fried chicken once, and it was a total disaster. But baked fried chicken I can get down with. Pinned! This looks FANTASTIC!!! Having this for dinner! I am SO excited about this! It looks perfect. We finally have an excellent Nashville-style Hot Chicken restaurant here in Columbus and it *might* be a new obsession. I can’t wait to try to make a baked version. oh nashville! i’ve become obsessed with meat & threes since moving here. :) this looks delicious! I’ve never been much of a fan of fried chicken either, but maybe I’m just too far north! I’ll have to try this version, it looks amazing, and no deep fryer! 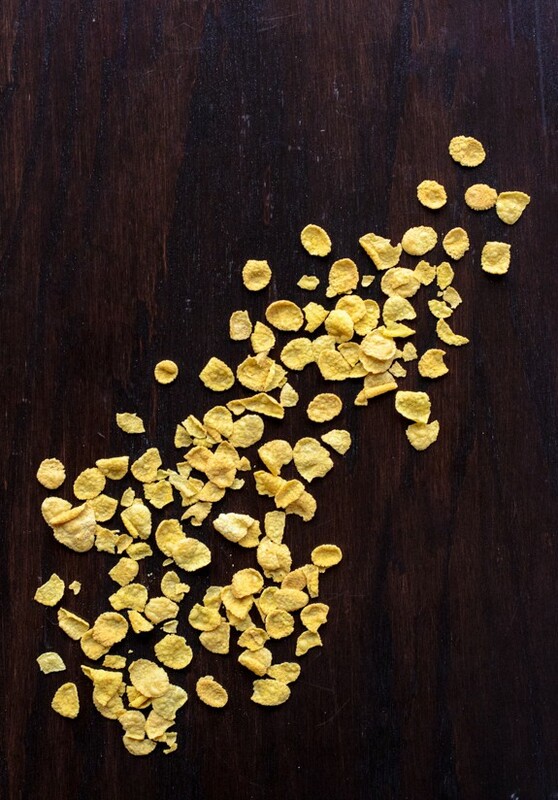 :) I love the use of corn flakes – that would be so crunchy! Juicy on the inside and crisp on the outside and love the cornflake crumbs. . which I have always been meaning to but have never tried by the way!! love this baked fried chicken.. and I always love your intros! Hi Erin, I’m so excited to try this! I’ve never made fried chicken in my life. My mother never fried anything. I will share this with our son (and yours and Ben’s friend), Richard – both the recipe and my first attempt at making it! Richard made real fried chicken a few times in his last year of law school. He said it was very labor intensive and extremely messy! He will be thrilled with this new “spin” on an age-old recipe! Many thanks, Erin! Laurie, I have never made fried chicken in my life either, even though it tastes amazing when it is homemade. This recipe is so much less fuss, I am going to use it every time I have a craving. Hope you and Richard love it too! Oven-fried chicken is one of my all time favorite meals, Erin! I made some the other night. Yours looks perfectly crunchy and delicious. It’s hard to stop at one piece! My hubby loves a fried chicken establishment in the South known as Bojangles. I’m not a huge fan because of the grease it leaves all over you…I think this recipe could be a good alternative. The texture (and your photos) look fantastic! You never cease to make me giggle! I am from Iowa, so my pronunciation of “bag” is made fun of on a regular basis out here in Seattle ;) So I really wish I was a southern belle, so my voice would be cute and I could eat more of this fried chicken!! Aaa, buttermilk chickens are the best. And I love the baked version even more. Can’t wait to try your recipe, Erin! 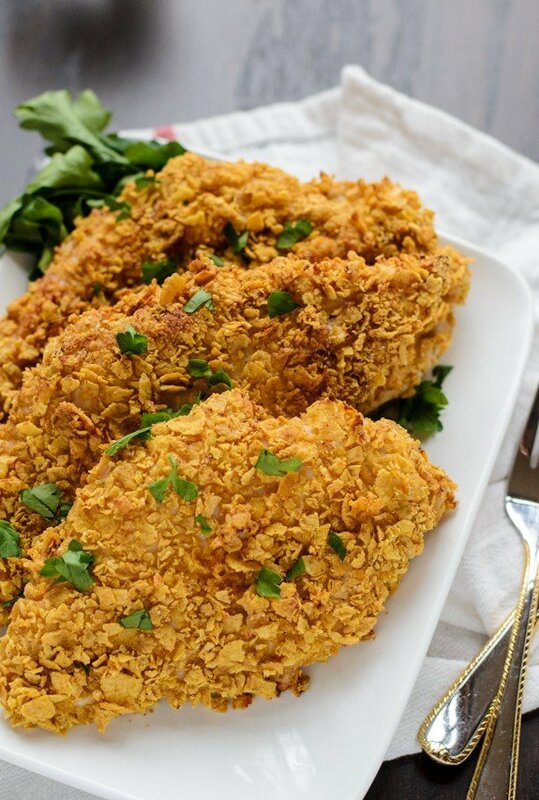 Oh my goodness, this baked/ fried chicken looks amazing. I love that it has that same great taste and crispiness of fried chicken – but with tons of the calories cut out! Man oh man these chicken looks good! I am definitely going to make this!!! Okay, my mouth is watering. I LOVE fried chicken, but you’ve totally sold me on this baked version (spicy buttermilk marinade?! Yes please!) I wonder if multigrain flake cereals would work as well… seeing as those are what I have in the cupboard, I might have to give it a try! Oooooeeee that crunch!! Crispy chicken is one of those foods that just makes my little foodie heart go pitter patter. Love at first sight. Re-heated leftover chicken that is still juicy?! I’m definitely on board with that! :) This looks and sounds great! Hi there! What sort of quantities would I be looking at if I only wanted to make 4 chicken breasts? Or even just 2? Also can you use normal milk instead of buttermilk? Hi Celia! To make a smaller batch, just reduce the quantities in the recipe proportionally. I think 4 breasts would be pretty easy to do-just cut everything down so that you make a third of the recipe total, since the recipe is written for 12 chicken breasts. With two, you’d be dealing with smaller fractions, but the same principle applies. Buttermilk for the recipe is really important, but fortunately you can make an easy substitution. One cup of milk stirred with 1 tablespoon of lemon juice or white vinegar and left to sit for 5 minutes will have the same effect. I hope that helps! Thanks so much. Buttermilk is expensive in New Zealand! Hi, I was wondering what type of paprika is used? Smoky, Hungarian or Sweet? I managed to convince my health concience Mum into making this as a ‘last meal’ before I move to Uni so I cannot wait to try this! Hi Ilona! I’m so excited and honored that you are trying this recipe with your mom. I just use plain old paprika (no special flavor), but I think it would be great with any of the ones you listed. Just pick the one you love the most. Discovered I had no chicken, so I made this using tilapia fillets. I also had no corn flakes so I used panko and replaced the poultry seasoning with Old Bay. It was the best baked fish we’ve ever had. Thanks for a great, flexible recipe! Diane, using this method for tilapia fillet sounds absolutely delicious. Thanks so much for letting me know how it turned out, and I’m thrilled that you enjoyed it! Hello, want to try this recipe but what type of hot sauce ? Doubt we have what your using in Australia. Hi Liz! Any hot, chili-based sauce will work well. I used Sriracha. Woaw ! Seem very tasty, and how uncommon with the corn flakes ! I may try this recepie :) Thanks. When you note needing more breading than the recipe calls for, do I need to make 1.5 times what is listed or have you already upped the quantities from the original published version you mentioned? I have a 4 year old that won’t eat stuff that has too much of a kick. Would the recipe work just as well without hot sauce and cayenne? Maybe do a third of the batch without and the rest with…baby coming in 3 months and finding foods everyone will eat that I can make ahead and freeze as well! Can you please share the nutritional values for this recipe? Hi Paula! I don’t actually calc the calorie content of any of my recipes (reasons why can be found on my FAQ page), but I do know that there are many free online calculators available. A quick Google search should give you good options! Hello! First I’d like to say I got turned on to some of your recipes through My Fitness Pal and I absolutely adore them. I can’t wait to give them a try, especially the chili. I did notice that nutritional information wasn’t available and saw in one of your replies to another person that the reason behind that could be found in your FAQ page. So I gave that a look see, while that got solved, I got turned to a link you put that is supposed to lead to a mini Amazon Store of items you recommend and even use yourself. I thought it sounded lovely, but the link just opens your FAQ page in another tab. I can’t seem to figure out how to get to that amazing sounding store. Any tips? Hi Samantha! First of all, I’m so glad that you found my blog! It’s great to have you here :) Second of all, I’m so sorry for the miss and glad thatyou told me. I’ve updated the link, but to save you some time, it’s right here. http://www.wellplated.com/favorite-baking-tools/ Thanks again! this looks delicious and I absolutely want to try it! However, I want to adapt this to the Paleo diet. Do you have any suggestions for Paleo substitutes for buttermilk and cornflakes? Thank you! I’m sorry, but I’m not super familiar with the Paelo diet, as I don’t follow it myself. For the cornflakes, you’ll want something really crunchy that makes a great coating (but you also need the flour to make sure the coating sticks). Ground nuts might be an option. The buttermilk is harder, as that is what gives the chicken its juiciness. I’d suggest looking for a similar recipe that’s already Paelo-friendly for ideas and seeing if you can create your own fusion of the two. Thank you for your reply Erin! I will see what I can come up with and let you know how it comes out. Hi Alexx! I’ve never tried using soymilk + lemon in place of buttermilk, but the lemon should give you the missing acid component that buttermilk has. I think that it is definitely worth trying. If you do try it, I’d love to hear how it turns out! I was wondering if there is a substitute for the buttermilk? Do you think goats milk might work? I’m allergic to cow’s milk. Hi Erika! I’ve never tried this recipe with goat’s milk or soymilk, but I don’t see why it wouldn’t work (although the flavor will be a bit different). I’d mix one of those two with 2 tablespoons of lemon juice (to create a buttermilk substitute), let the mixture sit for 5 minutes, then use it in the recipe as directed. Here, you talk about a marinade….”Pour the marinade into a medium bowl. Dredge each breast with the flour until fully coated, shaking off any excess. Then coat the chicken in the marinade, followed by a dredging in the cornflake mixture.” But what marinade? There isnt anything talking about a marinade prior. Completely threw me off. Hi MW—since “marinade” is a common term used for liquid mixtures that are used to marinade meat, here I was referring to the buttermilk marinade that the chicken rested in the ziplock back. I went ahead and added “buttermilk marinate” to the recipe directions. I hope that makes things more clear! Another new favorite recipe from your site! My husband always loves when I try your creations. I definitely recommend extra cornflake mixture! I ran out and I was only doing half a recipe with 5 pieces of chicken. I made this tonight–super delicious and easy! I couldn’t believe how moist the chicken was and how crispy the coating. I have a non stick chicken roasting rack which worked beautifully. Will definitely make again. Ginny, I am so happy to hear this! Thank you so much for trying the recipe and taking time to leave your review. It’s much appreciated! Well, as a southern girl who has lived her whole life in Mississippi I have yet to successfully fry chicken! This recipe might possibly be my saving grace :) and shock my sweet hubby who eats whatever I cook…no matter how burnt it is! I cannot wait to cook this for our Saturday night supper club! This is SOOOOO much easier than deep fried chicken Cindy. I hope that you, your hubs, and your supper club all love it! This looks delicious! However, I have a ton of chicken pieces in my freezer I’d like to use so I’m gonna go ahead and use legs and thighs and cook accordingly. 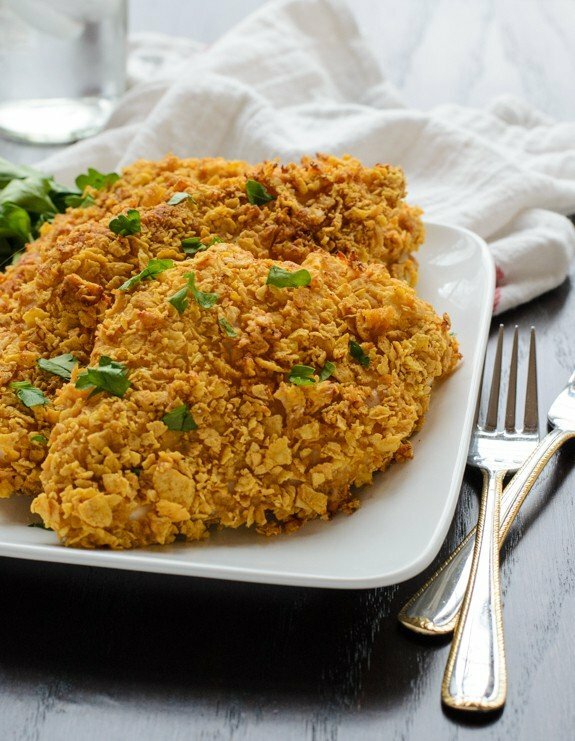 I have used Panko to make fried chicken and since I don’t have cornflakes in my house would you recommend I can substitute? Hi Janice! I’ve never tried using anything besides cornflakes in this recipe, but I think Panko is definitely the best substitute. Hope you love it! I love fried chicken and the best I ever had was at a Cracker Barrel on Sun. nights. We were coming home from a fair in MA and we stopped there to eat. We got 2 huge chicken breasts that were so crisp and juicy I thought I had died and gone to heaven! LOL I’ve made fried chicken at home and your right, it’s a real pain and a mess to make. Its never come out like in a good restaurant. I have a box of already crushed corn flake crumbs. I have to check the date on it and if it’s not expired, I’m making this chicken this week! Will let you know how much I love it but I know I will. Hi Erin! I know you said 12 chicken breasts, but do you have an approximate weight worth? I have massive chicken breasts (like 1lb each! They’re insane!) And I usually just cut them into quarters or halves etc for recipes. A rough estimate would be so helpful! Thank you! Kaity, those are HUGE! An average chicken breast is around 10 or so ounces, so I’d cut them in half. I know, they’re huge! But really convenient to divvy up for meals lol. I’ll probably try doing them into quarters! Hi Kaity—just FYI: If you cut them into quarters for this recipe, you’ll need to reduce the cooking time, since it’s currently planned for 1 whole chicken breast (which would be about 1/2 the size of yours). Just wanted to make you aware! This was WONDERFUL! They are so full of flavor and moist… sometimes chicken breasts can be dry but these were perfectly juicy! I have Celiac Disease so I had to make a few changes. Instead of flour I used corn starch and instead of corn flakes (NOT a gluten free cereal because of the coloring) I used crushed up ruffled potato chips (ruffled because they are thicker). I will definitely be using this recipe again, thank you so much! I am soooo happy to hear this Dawn! Thank you for trying the recipe and for leaving this lovely review. Your tips to make the recipe gluten free are great too! Isn’t it dangerous to reuse marinade that has had raw chicken sitting in it for hours? I have been told it is. Carole, since the chicken bakes in the oven afterwards, I didn’t have an issue with it, but certainly just do what you are comfortable with! Hi Lisa, I began adding nutrition estimates in 2016, but unfortunately it’s fairly time consuming so I’m not able to go back to previous recipes to add it. If you’d like, you can calculate it yourself for free at MyFitnessPal.com (what I use) or another online calculator. I’m sorry I’m not able to provide it for this recipe, but I hope MyFitnessPal will be a helpful resource for you! Can I use Wheaties instead of Corn Flakes? Hi Cheryl! Personally, I think that would throw off the flavor, since Wheaties are sweeter than cornflakes and wheatier in taste and texture. But if that doesn’t bother you, you can experiment.